It can be difficult to view Max Payne 3 on its own terms. It's a fine game in its own right, but it will always exist at least partly in the shadow of Rockstar's other, much bigger looming release—Grand Theft Auto V.
Since Rockstar released GTA IV four years ago, both Red Dead Redemption and now Max Payne 3 have brought enough tweaks and changes to the studio's brand of cover-based gunplay that GTA IV's action feels crusty and clunky by comparison. Max Payne 3 in particular refines Rockstar's third-person manshooting to a new and occasionally truly exhilarating degree. It's impossible not to want to see some of this stuff make it into GTA V.
Today, I'll be talking about five things I'd like to see carry over from Max Payne 3 into Grand Theft Auto V. And in a shocking twist, tomorrow I'll list five things that I hope don't make the cut. Here goes! This is one that I've been on the record about for a while now—I love playing GTA IV without a minimap. Thing is, that's an extreme way to play the game—it can be difficult to navigate without some sort of map to view. But the biggest problem with the minimap is that it shows all of your enemies as big red dots, and combat becomes an exercise in whack-a-dot. "Where's the last guy? Oh, he's hiding over here. Better kill him." 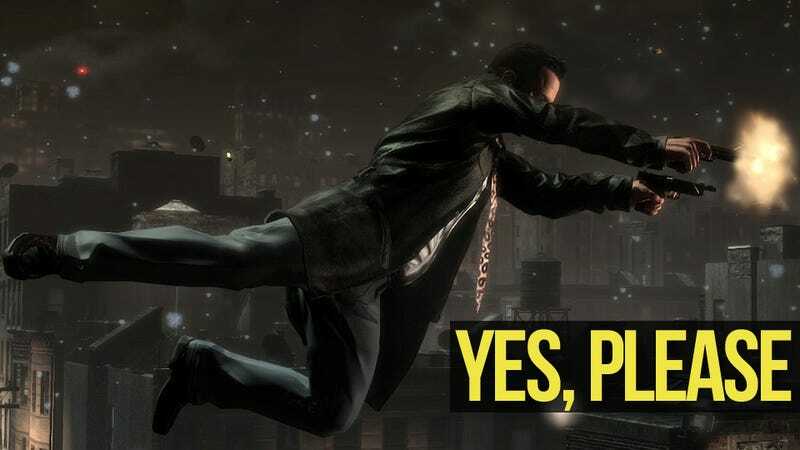 Max Payne 3 has no minimap, and therefore you're never quite sure where danger lies. That makes every combat encounter a supremely tense affair, particularly when you're near the end but aren't sure where that last man is waiting for you. While I don't think GTA V should do away with the minimap, I would love an option to have only the minimap visible and not be able to see enemy locations. I don't like this one for the reasons you may think - I'm not actually a huge fan of the more provocative aspects of Max Payne 3's gory slow-mo killshots. But we'll get to that in the "Things I hope aren't in GTA V" article tomorrow. For now: The thing I like about the slow-mo kill-cam is that it signals a checkpoint—rather than popping some intrusive text into your face, you know the fight is over because you're watching a cinematic, slow-mo shot. Due to the lack of a minimap, there needs to be some signifier for when Max has cleared a room of baddies. I really like this method, as it allows a singular sort of catharsis at the end of a tense shootout and lets you breathe a sigh of relief (while blowing away that last enemy in slow motion). Victory! At least, until the next gunfight starts. In Max Payne 3, you can be killed quite easily, but if you're carrying pain killers, you're allowed a "last-minute save." If you are killed while holding pills, everything goes slow-mo and you have a chance to shoot your killer. If you do so, Max downs a painkiller and keeps on going. This is a very smart method of keeping the game from being too punishing without making it too easy. You're not out of the woods, and you just used one of your precious painkillers, but all the same, you've pulled it out and will live to fight another day. Or, another five seconds. Its implementation in GTA V might require a bit of a reimagining of that game's health system, but it could also just function as a sort of "saving throw" anytime you get killed in a gunfight. You get one shot to take down your killer, and if so you get back 40% of your health. If your health reaches zero again… it's back to the checkpoint for you. Max Payne 3 is a difficult game, but it mitigates that difficulty in smart, subtle ways. If you die once, you'll reload the last checkpoint with full health (small comfort in such a lethal game) and the same guns and ammo you had last time. Die a couple more times, and it gives you a bottle of painkillers and some extra ammo. Die even more times and you get two bottles of painkillers and even more ammo. The enemies remain just as numerous and difficult, but you're a bit more powerful and therefore more likely to succeed. I love this method of balancing—it allows the game to be very difficult while keeping players from getting truly stuck. Yes, there are difficulty spikes and some really frustrating sequences (more on that in tomorrow's post), but in general, I'm a fan of Max Payne 3's brand of player assistance and would love to see something like that in GTA V.
This one is the easiest sell, I think, particularly given the success of Deadeye-Mode in Red Dead Redemption. Max Payne 3 may represent the best shooting Rockstar has done in a game yet, but it's still not as smooth as it could be. Cover is weird and overly sticky, and movement is still a bit too heavy and slow. However, the addition of bullet-time and the shoot-dodge go a long way towards making the game more balanced and fun, and they leave Max Payne 3's shooting feeling exciting and distinctive. I can think of no earthly reason why these features shouldn't be included in Grand Theft Auto V as baseline gameplay mechanics. There's a stylistic argument to be made against this: Max Payne has always been the John Woo-influenced slow-mo shooter, while GTA has embraced a more realistic vibe. But who cares? Seriously—bullet time makes Max Payne more fun, playable, and distinctive than other action games including Rockstar's other games. I really can't come up with a reason that Rockstar shouldn't just carry the entire system over into GTA V.
So there you have it: Five things that I'd love to see carry over from Max Payne 3 to Grand Theft Auto V. Tune in tomorrow, when I'll talk about 5 things that I hope don't turn up again. Yesterday, I listed 5 things that Rockstar should carry over from Max Payne 3 into Grand Theft Auto V. Today, I'll list 5 things that I hope they leave behind forever.